Recovery is possible for anyone, regardless of their background. This statement seems so simple, but it is perhaps one of the most profound and important lessons illustrated by this groundbreaking 30-minute documentary on peer support. Winner of the SAMSHA People's Voice Award, this dynamic film profiles people who have histories of mental illness and incarceration have turned their lives around, and who are now dedicating their lives to helping others like them. They speak candidly about their experiences with mental illness, the criminal justice system, and substance abuse that often came about as the result of self-medicating a mental illness that for most of their lives was never diagnosed. By changing their own lives, they show that recovery is possible. And by showing that recovery is possible, they become valuable role models for their peers. More about "Legacy of the Harp"
Mental health consumers Mayra, David, and Herman are in a six-month training course for people with mental illness and a criminal background. This program will prepare them to be employed at jobs where they can help others with similar life histories. Their goal is to transition from mental health consumers to mental health provides, by learning how to use their past experiences to reach out and help others like themselves. Their journey is not always easy – the training forces them to confront difficult issues in their lives - a challenge, indeed, but one that must be undertaken in order for them to be successful. They overcome these obstacles by creating a peer support network with their classmates. In the training course, they listen to one another’s stories, and provide advice and support for each other. They learn first-hand, and also poignantly demonstrate to the viewer, that peer support works. Albert’s mental illness caused him to try to take his own life on several occasions. He cycled through prison numerous times, until he was finally offered an alternative to incarceration program for people with mental illness three years ago. Today, Albert is a valued case manager at that same alternative to incarceration program. He has a caseload of people who he helps to stay out of prison. He is an inspiration to his clients, demonstrating through his own success that they, too can break the cycle of recidivism, gain insight into their mental illness, and change their lives. People with mental illness and a forensic background are one of the least heard from segments of society. LEGACY OF THE HARP is a rare film where people with this background talk about the issues that have affected them the most. Their perspective provides an invaluable asset to their peers, as well as policymakers, law enforcement, and organizations that provide services to this population. As David, a student at the training program says, “Everything can’t be taught in a book. What we bring to the table takes other people years to learn . . .We didn’t learn it – we lived it. It was us.” The students in this film are true experts on these issues, and their perspective is too often missing from public discourse. 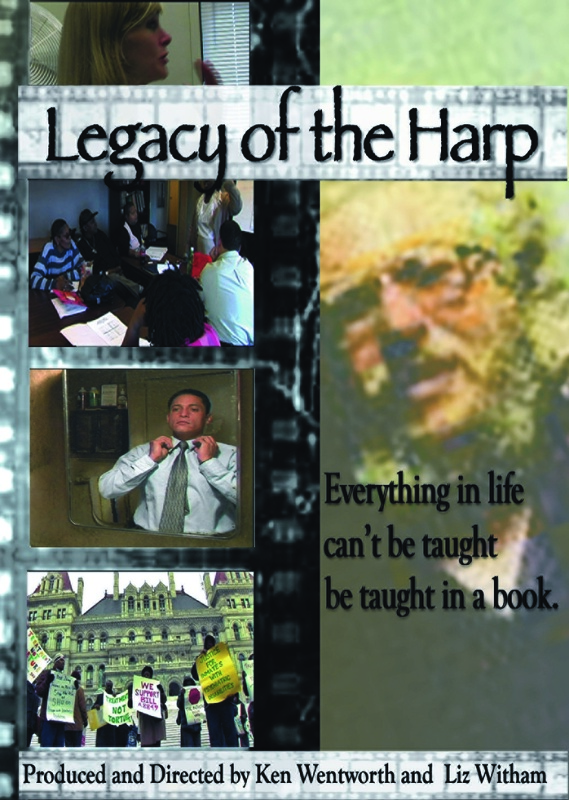 LEGACY OF THE HARP gives their vital insight the opportunity to be heard, and to be learned from. Their courageousness in sharing their stories, and their ability to succeed against the odds, makes them an inspiration to us all.